Classical Academic Press has made a name for themselves with their creative, Classical curriculum. Besides the standard subjects that fall within the Classical genre - Latin, logic, rhetoric - you’ll also find French, poetry, and grammar among their selection of products. We’ve happily discovered that all of their programs are a great fit for us - and The Art of Argument is no exception! Before we take a peek at The Art of Argument, let’s chat about why it’s important to include this subject in your homeschool schedule. Wondering if your child is ready to study logic? Here’s one clue - is he or she arguing with you? Then it’s time to teach them to argue logically! Learning can be a family pursuit (and I think it’s better if it is!) - you can discuss advertisements, political debates, and many other things, making the experience a natural part of family life. I received The Art of Argument for free in exchange for sharing my honest opinion of the program. No other compensation was provided. We’re huge fans of the curriculum from Classical Academic Press (we absolutely LOVE their writing series) so we knew that their logic program would most likely be a good fit -- and we weren’t disappointed! We’ve used a few different things for logic and The Art of Argument tops the list as our favorite. The program, which focuses on Informal Fallacies, includes a student book, a teacher’s manual, and a DVD set. It can easily be scheduled from once to a few times a week - becoming a year-long or semester-long course, depending on your plans for the year. If you prefer to move at a faster pace you could easily cover The Art of Argument and another of the logic programs from Classical Academic Press (The Argument Builder or The Discovery of Deduction). The student book is a ‘worktext’ -- a textbook and workbook in one. Students read the lesson material and complete the written exercises in the same book. We love that the inside front and back covers list each fallacy -- it makes for easy review! The teacher’s manual is a replica of the student book with answers to all lesson and review material as well as tests and a final exam that can be copied for students to complete. The 5-DVD set covers each fallacy in the text -- with a video discussion for each one. It’s a great way to include more discussion and debate about the various fallacies. What are Informal Fallacies, anyway? Informal fallacies, also known as logical fallacies, are arguments focused on everyday language. It’s the language of everyday debate and discussions - from advertisements to political campaigns. It differs from formal logic, which instead, focuses on abstract thought. Even if you never include a course in formal logic, taking some time to learn about informal fallacies will help your children reason and discuss effectively. 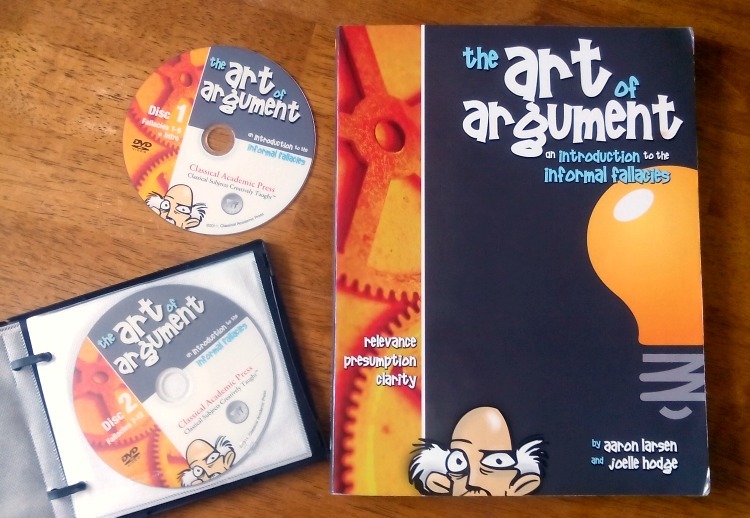 In The Art of Argument, you and your children will discuss 28 informal fallacies using clever dialogues, silly advertisements, and plenty of practical application and review. Up to this point, we’ve only done some fun projects and workbooks for logic -- The Art of Argument is our first step into the logic pool. I’ve decided to keep it more informal at this point so we planned to take a year to work through the program. Each week we read about a fallacy or two, discussing the lesson, laughing at the advertisements, and watching a lesson from the DVD when we’re so inclined. My daughter loves the silly dialogues and clever advertisements. 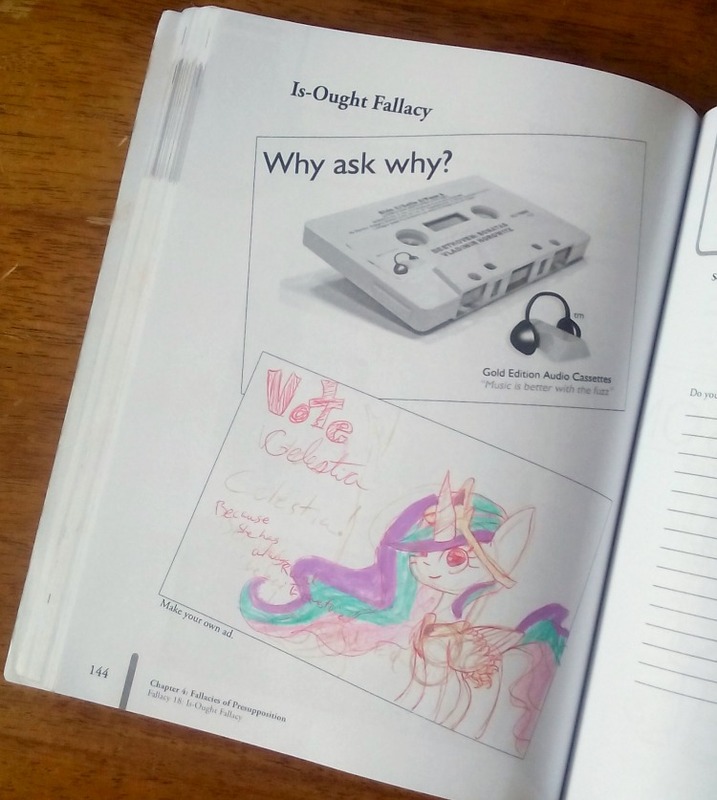 She’s learned quite a bit about fallacies and has started applying her new knowledge to everyday situations - commercials, billboards, and news events. As a mom, I’m very proud to see how she is learning to analyze words and arguments! Are you studying logic with your children? Have you used The Art of Argument from Classical Academic Press? Leave me a comment and tell me about your experience!